“Whoever decided to build a golf course through this tract of land must have been imaginative. Las Ramblas works remarkably well and offers a completely different test from its neighbours. It has a complicated layout that rambles through humps, hillocks, deep ravines and rocky canyons with lots of trees and, so as not to be too lenient, a lake. Coupled with tiny greens, this course is a nightmare for beginners and the impetuous, so the best way to approach Las Ramblas is simply to have fun. Having said that, there is generally a safe route to most holes. Many are quite short so par or even birdie is not impossible – if you can find your way to the fairways and greens. Blind tee shots are always irksome, though, and there are a few of these. For more information on Las Ramblas click here. To view the Las Ramblas webcam click here. Facilities : Clubhouse, driving range, buggy hire, hand and electric trolley hire, putting green, practice bunker, glof classes, club rental, pro-shop, restaurant, bar. “This course has more of a classic layout than you tend to meet in the area. It is not particularly long, but wonderful to play. Villamartin has been established for nearly thirty years. On the downside, it’s facilities are surprisingly rundown, the pathways from green to tee are quite rough and the golf services almost non-existent. However, the overall character of the course overcomes any quibbles about the peripheries. Many holes require a drive and wedge, but both shots must be accurate. The greens are beautiful, generally large and a joy to roll over. The 9th plays over a frog pond with swallows swooping to catchflies. The 14th is a remarkable par 5 with two canyons to carry. The 17th is a long par 3 well over 200m/219yd from an elevated green across a valley to a small green – a demanding prospect. Facilities : Clubhouse, driving range, buggy hire, hand and electric buggy hire, pitching and putting greens, practice bunker, golf tuition, club repair, club rental, pro-shop, restaurant, bar and showers. “This is a visitor-friendly club with excellent facilities. 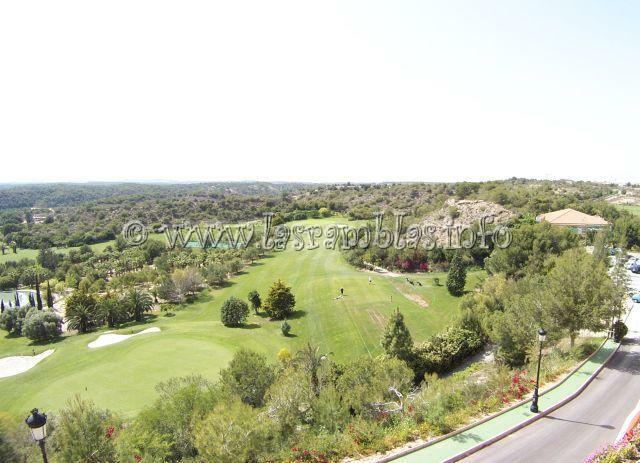 Real Campoamor’s brand new clubhouse perched on the highest point of the property offers inspirational views. The course is comfortable for every level of player; with wide open fairways and a dearth of hazards, even beginners will not feel intimidated. Awkward lies are the most common difficulty that you will encounter. The course flows over rolling terrain so you are usually playing up or downill. Thankfully, however, this does not include sideways-tilted fairways. A variety of trees line most holes and help to define them. Apart from this there is plenty of room, so a misdirected shot will be punished but rarely lost. Raised greens are another regular feature on this course. There is a stiff rise at the 7th, which is a difficult par 5. The best advice is to play for position on this and the rest of the back nine. The fairways tend to be long and curving with several blind tree shots to negotiate. The best hole is probably the 3rd, a par 4 that is long from the tee, driving between two big cypress trees that are barely ten metres apart. The second shot (if you’re got one) is a downhill carry to a bunker-surrounded green. The 8th hole is another good drive from a high tee, with an excellent view of the fairway. 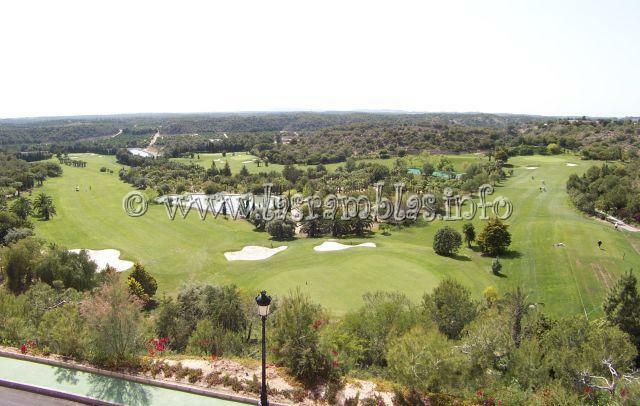 For more information on Real Campoamor click here. 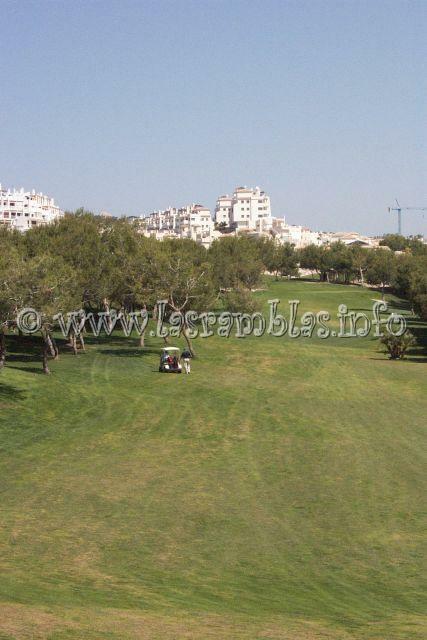 To view the Campoamor webcam click here. This course is a little exposed, especially on the back nine, but this probably adds to its “big-hitter” appeal. From the tees it can be long and testing, but there is a diversity of holes that keeps the course exciting. Each hole presents a different characteristic. The front nine is more European with lakes, trees and flowers, whereas the back nine is more spartan with highs and lows and interesting views. Tree plantations will add to the course’s appeal as they mature and come more into play. The 5th is a par 5 that is reachable in two , but a lake in front of the green makes you think twice. The 7th is the most difficult hole. It is long, but impossible to take a driver off the tee with a lateral water hazard ahead. Use a 3-iron for 183m/200yd and another onto the green. Bonalba’s greens can be fast, especially on the back nine. Although from the back this can be a tester, there are good forward tee options allowing everyone a pleasant round of golf to suit them. Locationb A7 – Alicante – Valncia exit 67 and signposted. Facilities: Paddle courts. Clubhouse, driving range, hand and electric trolley hire, putting green, golf tuition, club repair, club rental, pro-shop, restaurant, bar, tennis courts and showers. For more information on Bonalba click here.